"The ruling today on the bus crash in Sweden"
"Three young people were killed and 38 people were injured when a bus went off the road in Sweden two years ago. Now comes the judgment against the bus driver. Some of the victims, or their relatives, would like to see a conviction. For others it is less important." "the Bus was hired by the sports club at a school in Skene in Sweden, who made his annual ski trip. A man in his 60s was the sole driver on the trip. When the accident happened at seven o'clock in the morning, he had worked for about eight hours since their departure the night before, but neither eaten or drunk during the time." "the Driver, who works at a large bus company, was charged with reckless driving, involuntary manslaughter and causing bodily harm. He denies the offences." "today gives the Borås district court in its ruling. The prosecution has called for probation and a fine." "Among the many wounded, and all of their relatives, are various thoughts on the importance of a conviction, or acquittal, the judgment." "– There are some who absolutely want to see a conviction and find that it is very important. At the other end of the spectrum are some who believe that it is not important that the driver gets convicted, said attorney Marcus Josefsson, who is plaintiff's counsel, for 33 persons in the judicial process." "– But everyone thinks it is good that this was investigated and went to the prosecution, says Josefsson." 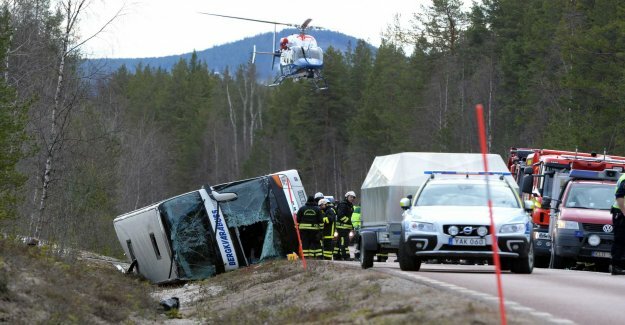 "the Swedish accident has investigated the accident and pointed to several factors that contributed to that, it was so bad:"
"Despite the fact that the road was narrow, with steep slopes on both sides, where the speed limit set at 100 kilometres an hour." "Less than a third of the passages set belted. All those that were killed, and four of the five severely damaged, went off without a belt." "the Driver was likely to greatly nersatt vigilance, at least temporarily." "the bus company had not managed the risks associated with night work properly." "In the commission's report shows that the bus driver had stopped at a gas station in Filipstad to drink coffee. He had driven about 30 of the roughly 70 miles from Skene to Klövsjö, which was her destination. But it was after midnight, and the gas station was closed." "At a rest stop a bit later along the way, there was nothing to buy. The driver plan was then to stay and have a coffee in Sveg in the morning. But two miles before the town of Sveg the accident occurred. The double-decker came off the side of the road. The driver tried to steer back up again, but the vehicle overturned." "He worked normally in the daytime, but had been driving to the Klövsjö village the day before departure then the planned driver already had too much driving time." "– There are victims here who believes that the bus company has a large debt in this, with the pressed driving, that it did not have two drivers and so on. I have no comment on it. But I can say that the prosecutor has researched it, and come to the conclusion that no breach has been committed, " says plaintiff's counsel, Marcus Josefsson." "the Accident occurred at seven in the morning on 2 april 2017, just south of Sveg, in Härjedalen." "the 58 passengers were on board. Three young people were killed. Five people were seriously injured. 33 people received moderate or minor injuries." "the Bus was on the way from the Skene in southern Sweden to Klövsjö in Jämtland. There was only a driver." "Man had been driving around 60 of the total of 70 miles when the accident happened." "the Bus came off the road, down a steep slope. When the driver tried to steer up on the road again overturned double-decker." "Less than a third of the passages set belted."